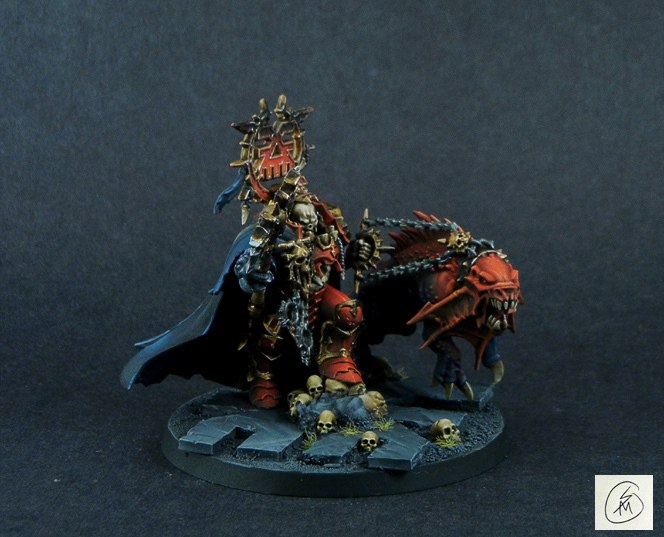 Part one of a recent commission, Enjoy! Look alive lest ye be a dead man! 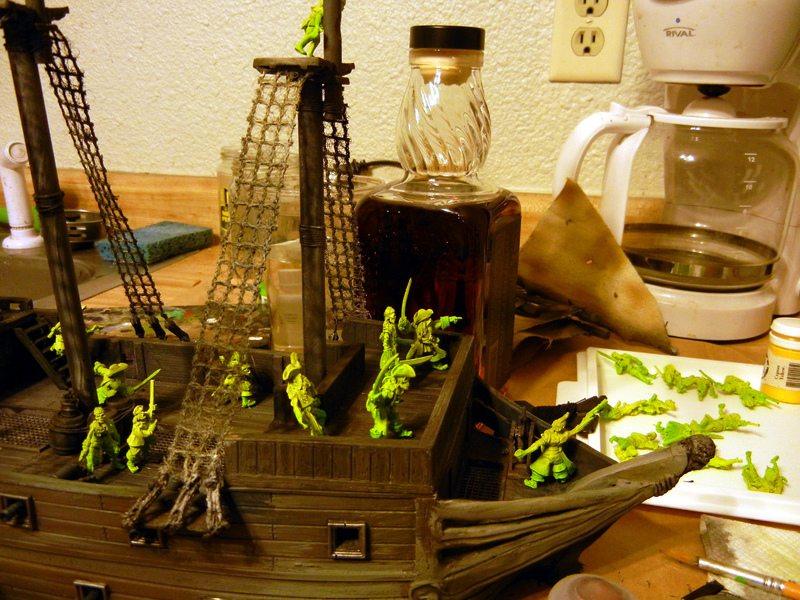 In the end the ship never made it to the light box, size for one and deadlines for two. It was needed for a weekend of gaming and the old handoff. So here it is in special suspension amist the briney swarth of my back yard. 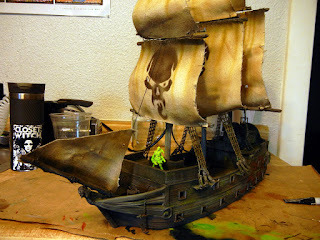 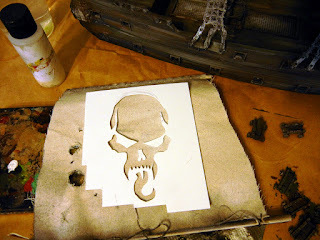 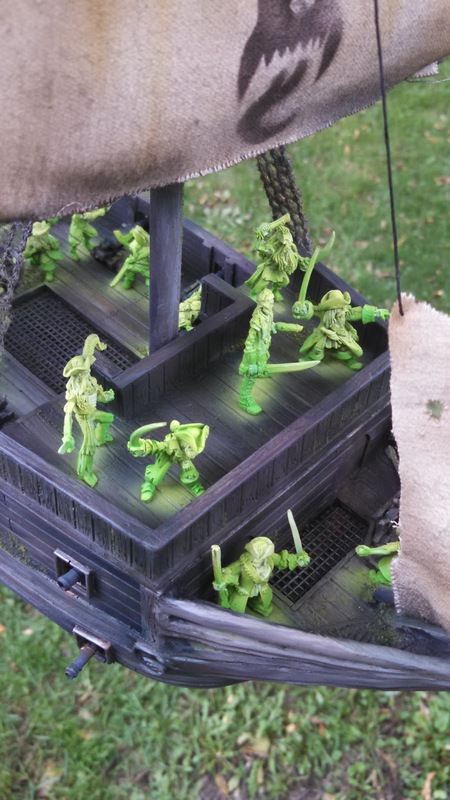 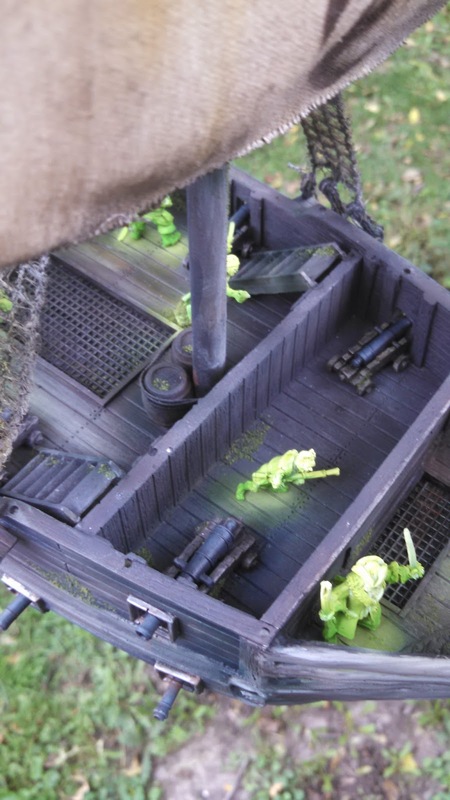 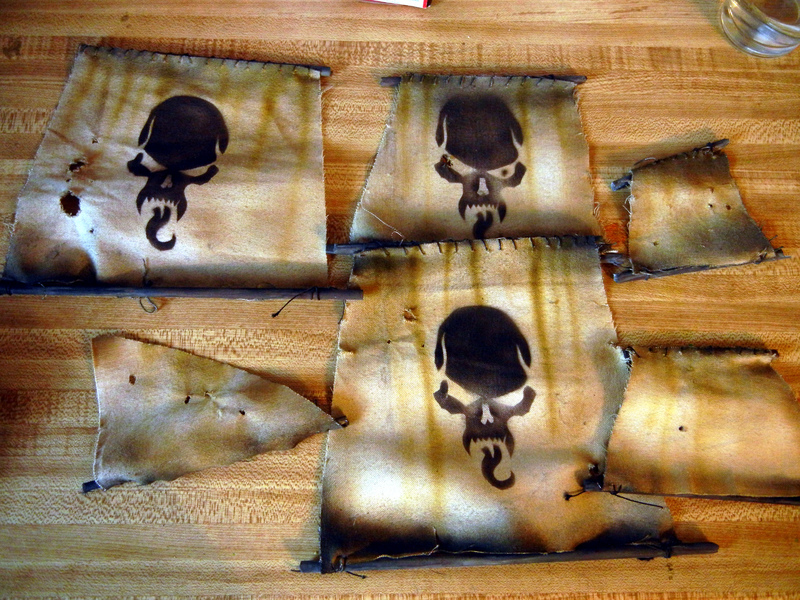 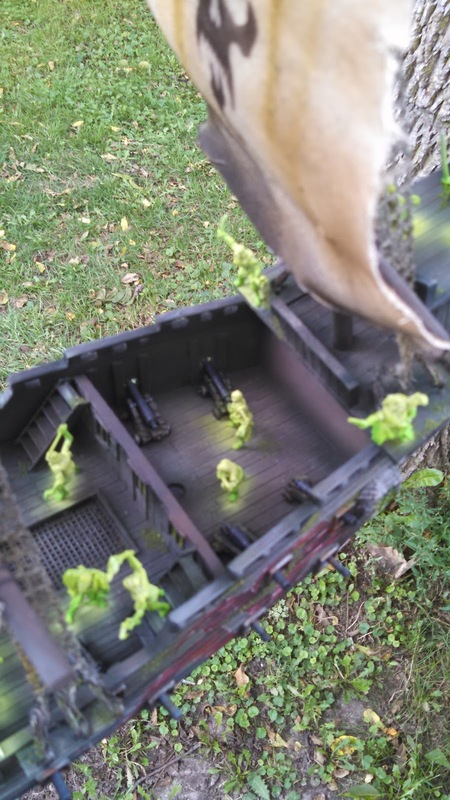 Before I post the finished pictures of the ghost pirate ship, here's what's around the bend. 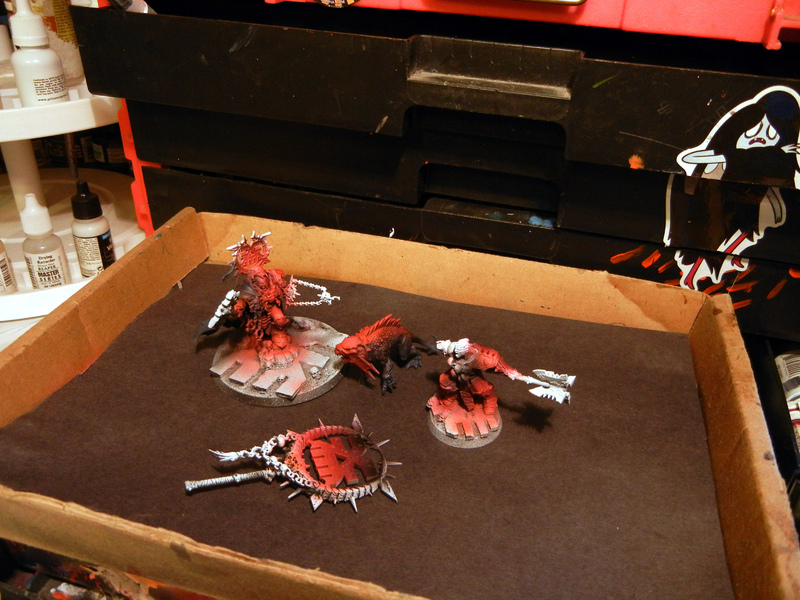 Can't stop painting but I can delay taking finished pictures, I'm really good at that. 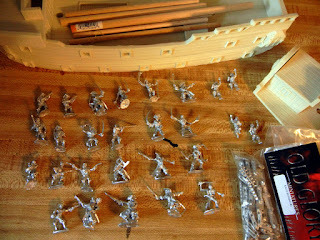 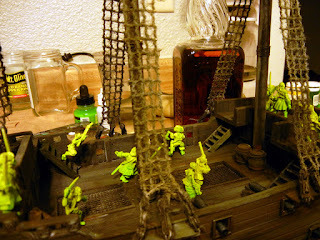 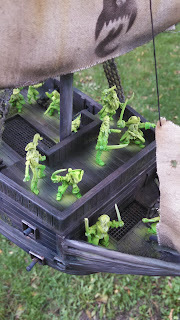 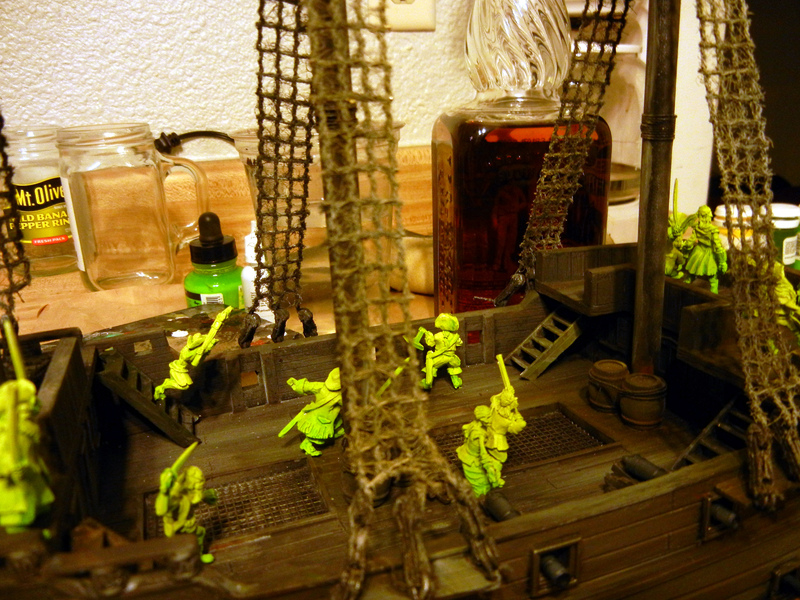 After the ship was finished I jumped right into some single miniatures. 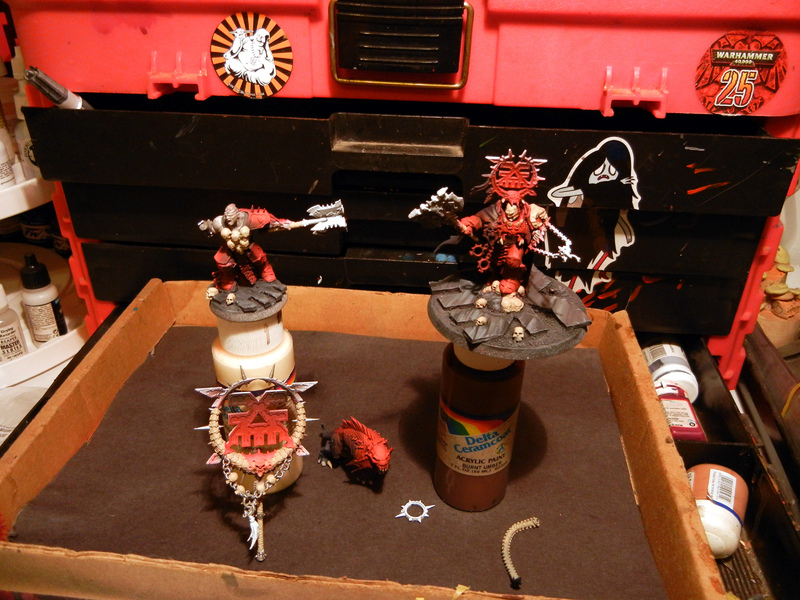 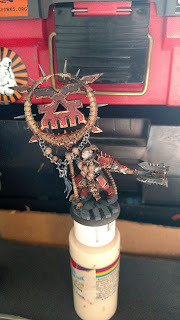 So I got right to it and quickly realized the Ebay seller had done my client a solid and excluded the front shin plate of the Khorne lord (Forshame on you, you know what you have done!). This model was ordered over a month ago and I didn't want to send my client after the missing piece. 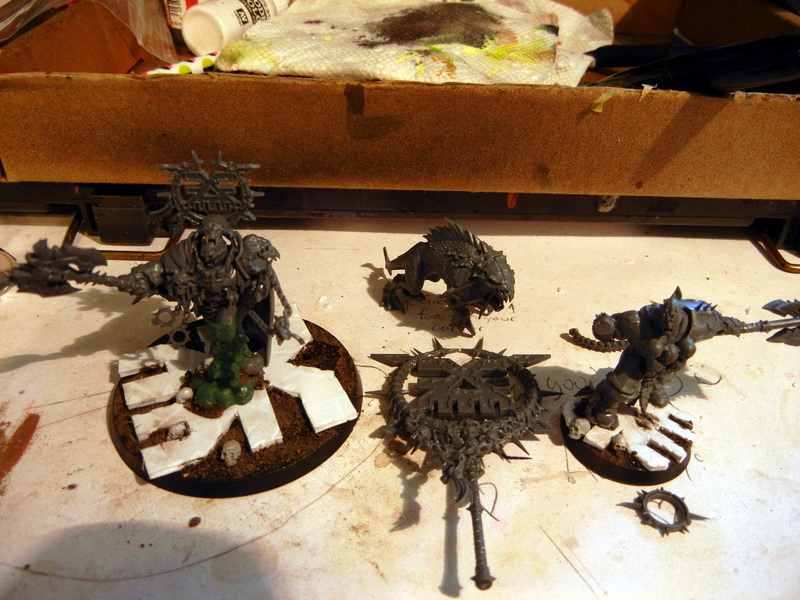 Luckily, there was a second lord on hand that I could instant mold the missing bit from. Shabba! 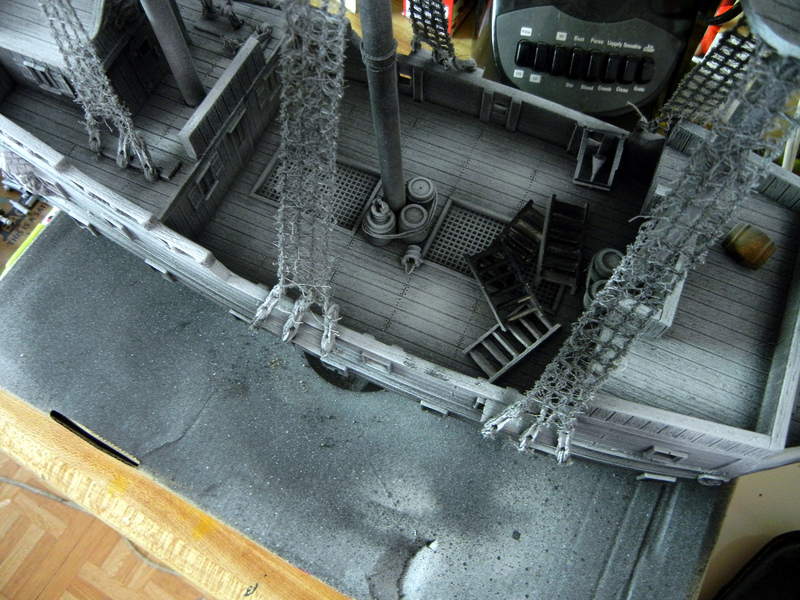 When I last left off the ship was just coming together. 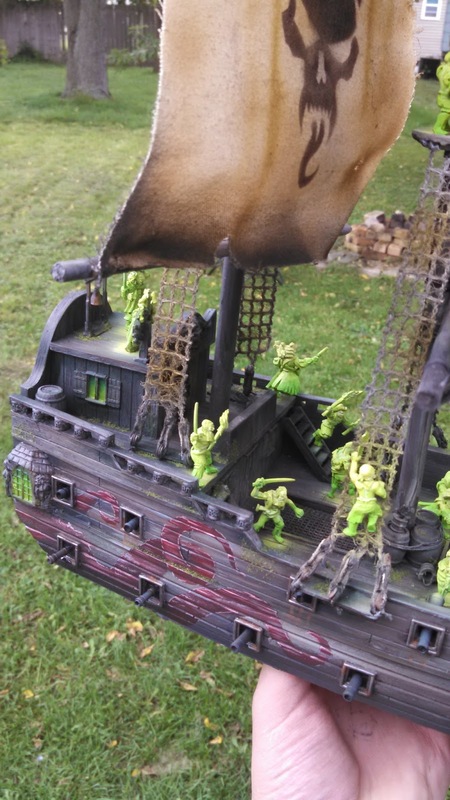 Here be phase two of the haunted scooner. 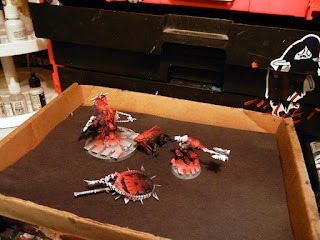 I had to figure out a quick and effective way to the get the 30 some crew painted up. 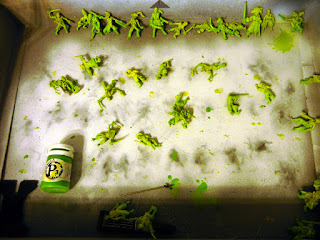 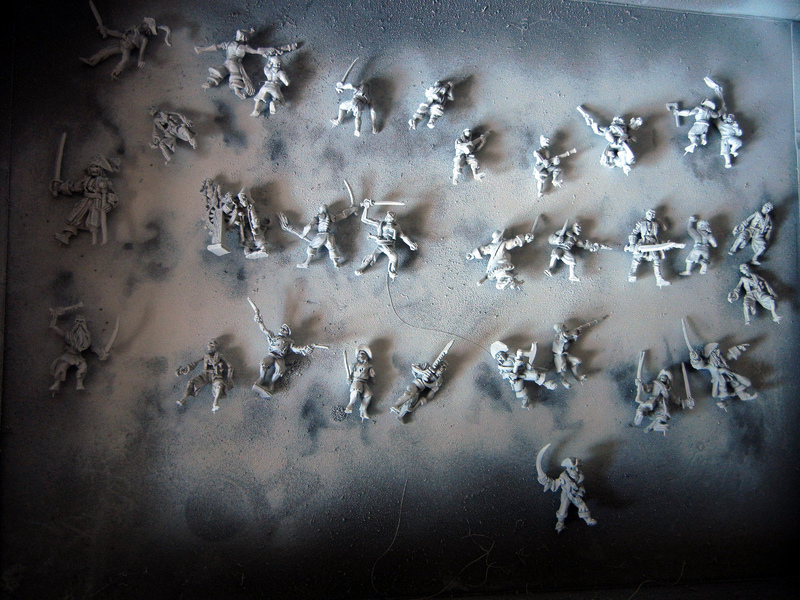 In the end I opted for a spectral green which will allow me to cast lightsourcing from each crewman. Coffee in the morning, whiskey in the evening. 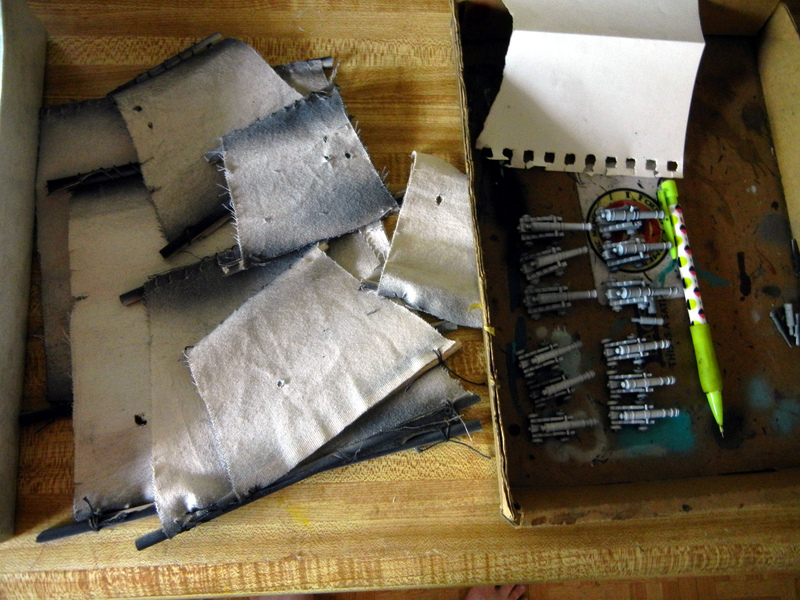 It just felt right to take some pulls during this project ha. At this point it's complete, just waiting for to take the final pictures by a nearby river. 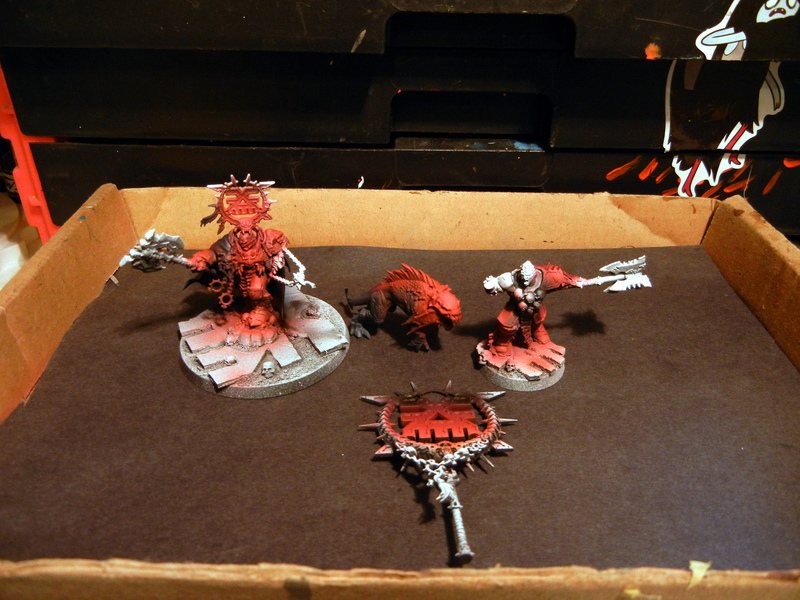 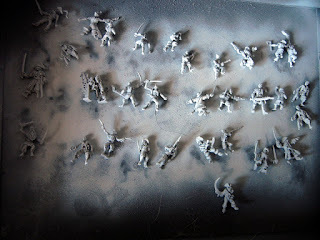 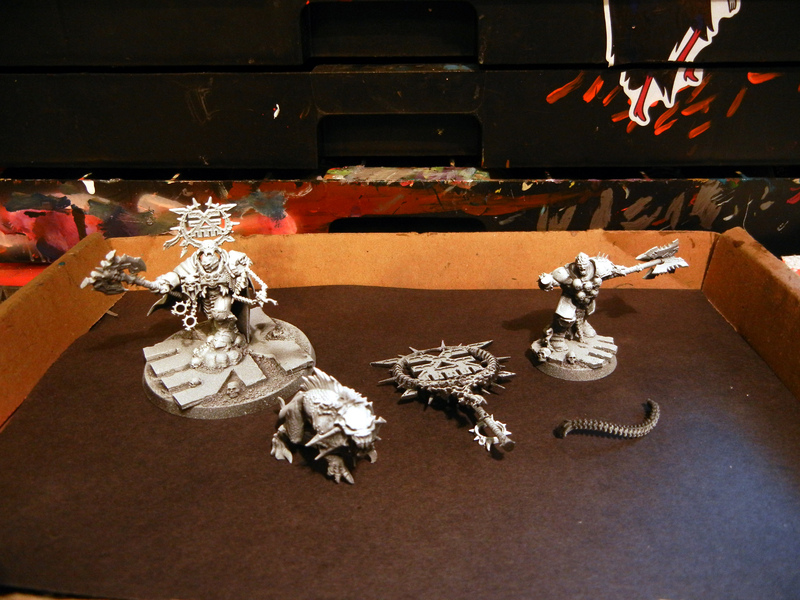 Many more things on the way, if only my blog could keep up with my brush. Better get back to it! 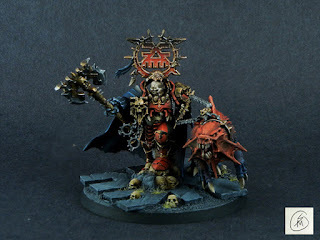 Yaarr! 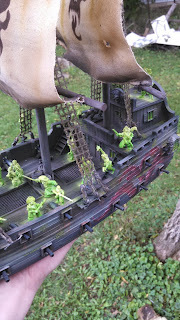 Here be Ghost Pirates! 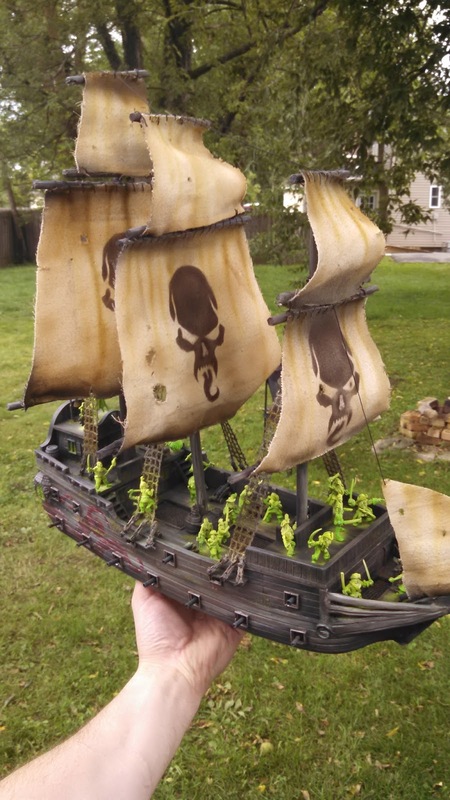 I've been hoisting sails and trimming pewter! All part of a commission from my buddy Darren for an upcoming event. This will be the "Dying Dutchman" in the game, I'm pretty sure the game is following the rules for fistfull of seamen if you happened to play at Adepticon this year. Here be the makins of such a ship! 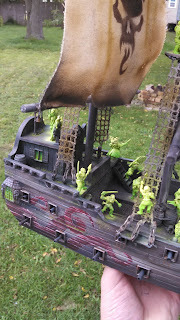 Here is the cast of pirates, not the most dashing models but they get the job done and they are all unique! 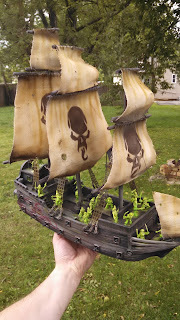 I also had to make the sails myself..Kind of a head scratcher. 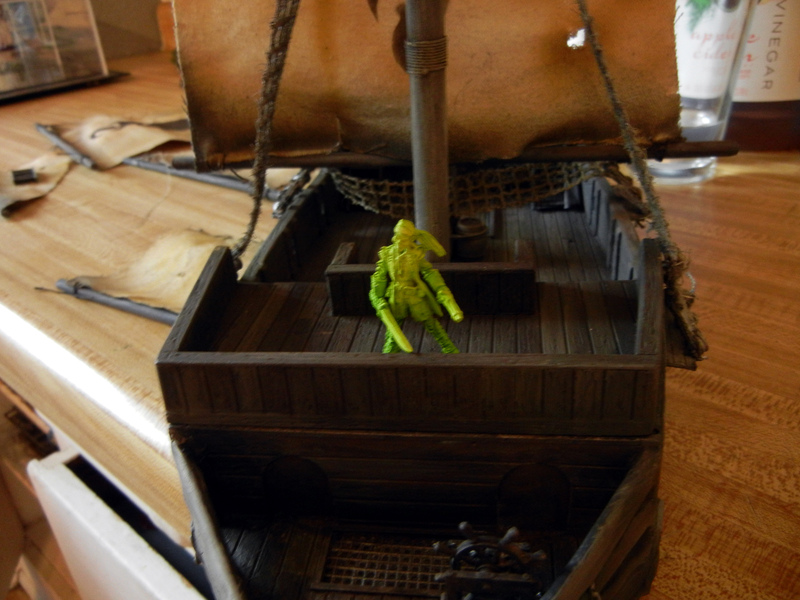 It was hard not to make fully functional sails and I had to balance the time and detail. 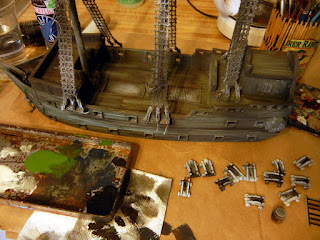 If I was on a island though, this is how I would build my sails ha. 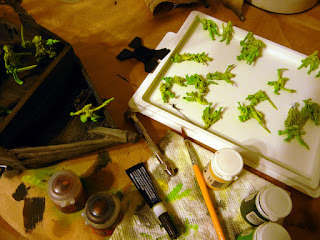 Once all the rigs and jigs were squared away though, it was time for some wet blending.